Aura Caravans is a mid-sized Victorian-based manufacturer with a good range of models and layouts in its stable. One of these is the Explorer which, amongst other layouts, is available as a family four-berth caravan (with an optional third bunk to make it a party of five). 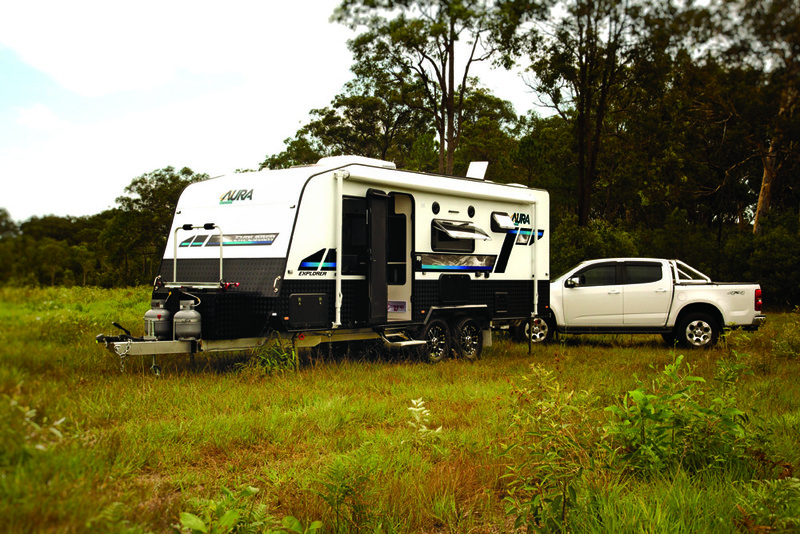 My review van came from Brisbane-based Kratzmann Caravans and when I arrived, the Explorer was hitched up behind a Holden Colorado ute. Given the van’s ATM of 3000kg, this was a good choice and certainly handled the van without any problem. 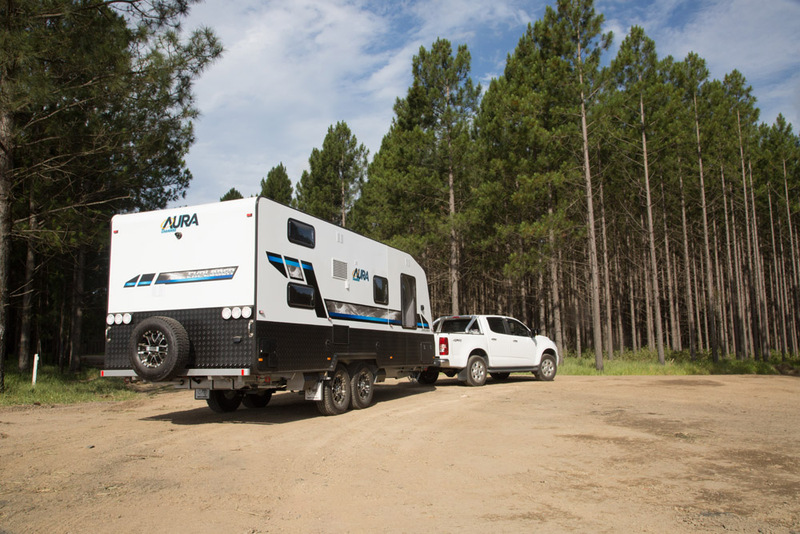 In the best traditions of an Australian-built caravan, the Explorer has a DuraGal box section chassis with 150mm x 50mm (6in x 2in) main rails and drawbar. For extra strength in the front section, a smaller 100mm x 50mm (4in x 2in) section is laminated to the top rail between the end of the drawbar rails and the suspension mounts. Fitted between the main rails are two 95L freshwater tanks either side of the tandem axles and a 110L grey water tank at the rear. Additional chassis fittings include two checkerplate battery boxes fitted to either side of the offside wheels. Aura clearly has offroad travel in mind with this caravan as it comes with the Cruisemaster DO35 hitch up front and AL-KO fully independent suspension complete with trailing arms, coil springs and two shock absorbers per wheel. On the drawbar itself are two 9kg gas cylinders, the usual handbrake and jockey wheel fittings plus a decent-sized checkerplate toolbox. On the offside, the bin is fitted with a slide-out making it suitable for something like a generator. An interesting option on this van is the Fiamma bike rack, a handy feature for those who like to cycle while on tour, although if the front bins are fully loaded then a ball weight check would be a good idea. Above the chassis, the body structure is a mixture of the traditional (Meranti timber) with something more contemporary — a mixture of aluminium composite walls and a full fibreglass roof. Staying with the contemporary look, there is a lower waistline of alloy checkerplate on all four walls. One of the more obvious features of the Explorer are the distinctive Eurovision windows which are quite large, particularly the front windows. Given the position of the security-fitted habitation door and the front window, there’s the frequent problem of not being able to have both open at once. In addition to the storage box on the front drawbar, there is the additional storage space of the front tunnel boot. Black and white with a bit of grey for the cupboards is definitely the colour theme of the Explorer but don’t worry — it is not as stark as it sounds! Indeed, the overall impression is one of a very light interior. Being a family van, there are a couple of bunk beds in the rear area, along with the obligatory bathroom. 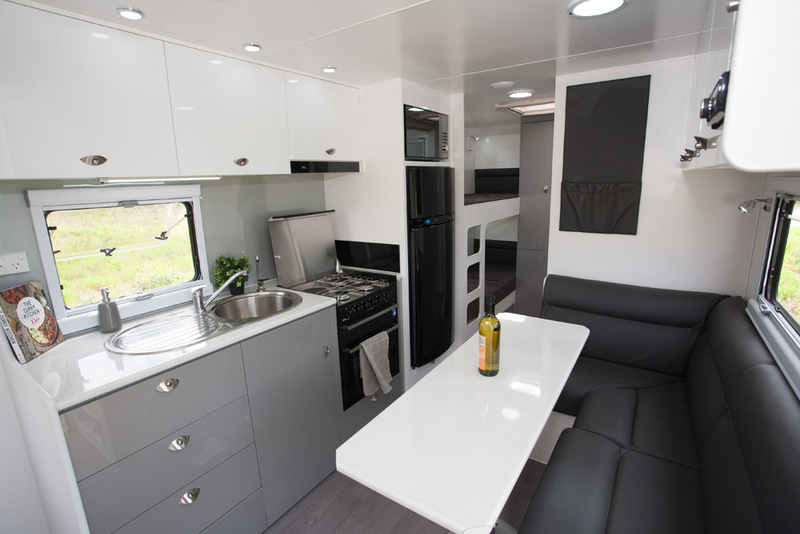 The rest of the van follows the fairly standard layout theme of an offside kitchen area, nearside L-shaped dinette and a front island bed. A feature of the interior is plenty of internal storage space. The overhead lockers, rear wardrobe and the under-bed area all offer places to stash things — essential in any family caravan. All the drawers have metal sides and the door/drawer catches are the clam shell/push-button type which are quite easy to use. Up front, mum and dad get a 1.83m x 1.53m (6ft x 5ft) island bed with the usual bedhead arrangement of overhead lockers, side wardrobes and (very short) bedside cabinets. Very large windows are fitted on either side of the bed but, without wishing to be a prophet of doom, they would be very easy for someone with less than desirable intentions to clamber in and out of. 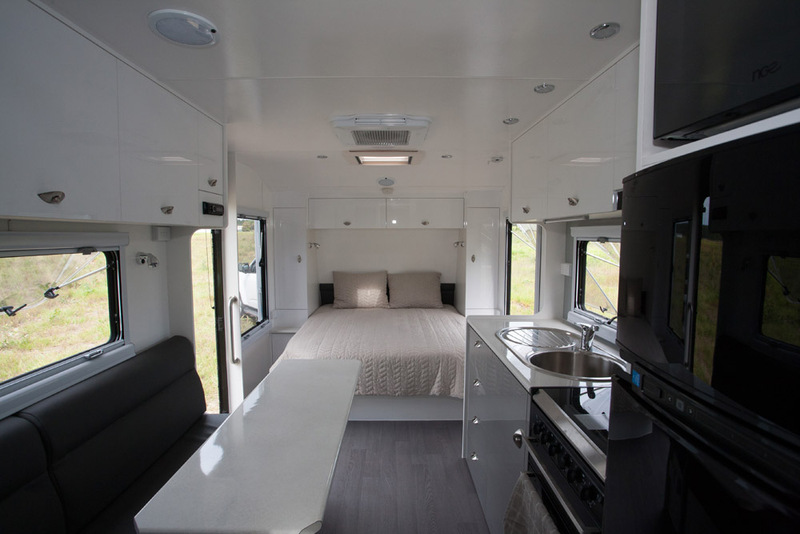 In a van that is 6.4m (21ft) long with a front island bed and bunks/bathroom in the rear there will be a bit of compromise in the mid area, which is why the kitchen bench isn’t overly long. It does come with the full kit in terms of appliances, that is stainless steel sink/drainer, four-burner cooker/grill/oven and a 177L Thetford fridge with NCE microwave oven above but there isn’t much benchtop area. Storage is fairly reasonable with three drawers, a cupboard and two overhead lockers. There is a third overhead locker above the rangehood but it’s really for the BMPRO battery management system and essentials such as switches for the hot water. Given the space restraints, the bathroom isn’t quite going to be the full-width item but it still comes with a separate shower cubicle at one end and a Thetford cassette toilet at the other. This leaves enough space for a pedestal-style washbasin and a small cupboard in the rear. Not being oversized, I’d reckon if you are staying in a caravan park you'll be heading for the amenities block during peak times! For remote camping, the Explorer is fairly well equipped. Two 100Ah deep-cycle batteries can supply the 12V load for a few days, especially as two 150W solar panels are fitted to the roof. As noted above there’s a grey water tank fitted for environmentally sensitive areas, which means the only real limiter is the 19L toilet cassette tank. In many ways the Aura Explorer has been designed with offroad travel in mind because of the AL-KO independent suspension and battery/solar panel setup. It’s also designed for family use as well with the option of a third bunk for additional kids or guests!